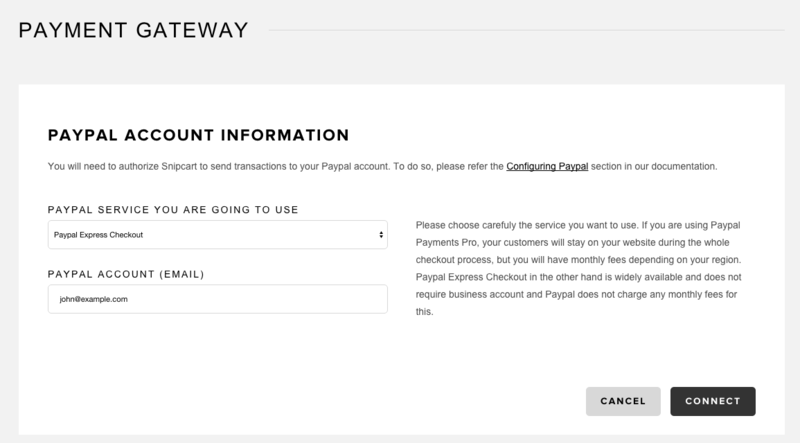 PayPal is just one of the many e-commerce payment gateways we support. 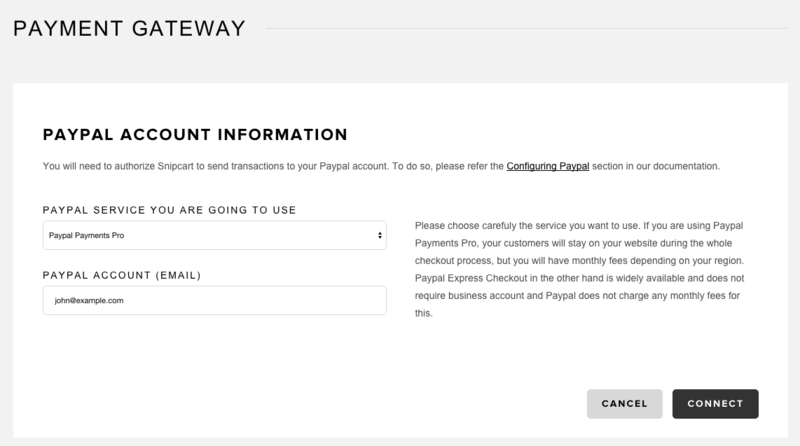 However, following many requests, we went ahead and added PayPal-specific instructions here. We support PayPal Payments Pro and PayPal Express Checkout. PayPal Payments Pro requires a business account and may have a base monthly fee. But your customers will not be redirected to PayPal website during checkout; they will complete the whole checkout process directly on your website. PayPal Express Checkout can be used by almost anyone, but your customers will be redirected to PayPal website to enter their credit card details, they will then be redirected to your website and will be able to finalize their order. When your account is ready, you will need to grant Snipcart permissions to manage your account. To do this, log into your PayPal account and click on Profile in the menu. Click on Profile and settings in the dropdown menu. Now click on Grant API permission. Last step is to login into Snipcart dashboard, click on Store configurations > Payment gateway and select PayPal Express Checkout in the service dropdown. Finally, enter your PayPal account and hit the save button. All the transactions on your website will be sent directly to your PayPal account! When your account is ready and business validated, you need to grant Snipcart permissions to manage your account. To do this, log into your PayPal account and click on Profile in the menu. 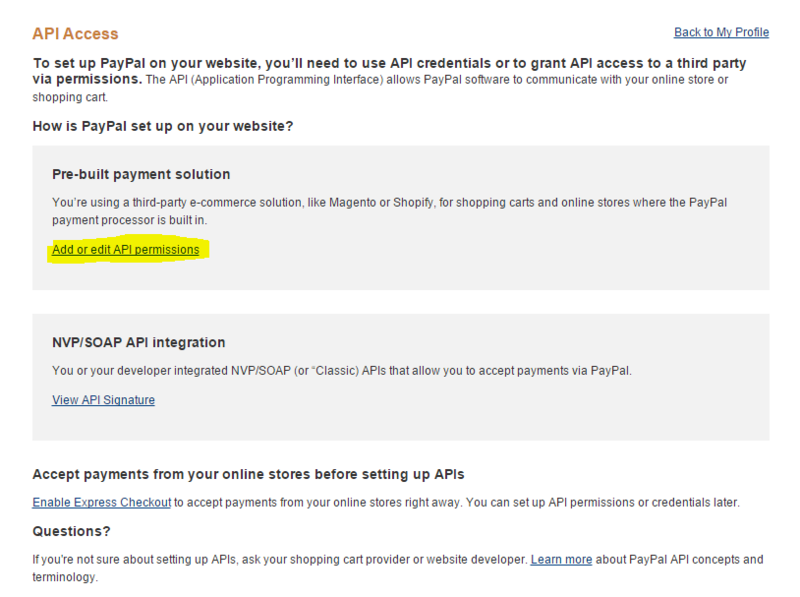 Then go to My selling tools section and you will need to update your API access. You now need to add Snipcart as a third party allowed to make some actions on your behalf. Click on "Add or edit API permissions". Last step is to login into Snipcart dashboard, click on Store configurations > Payment gateway and select PayPal Payments Pro in the service dropdown. Finally, enter your PayPal account and hit the save button.